I’ve always had a soft spot for nursery rhymes. My girls grew up with them. We read tons of nursery rhyme books, did a lot of crafts, and now we’re going to do some nursery rhyme science experiments. 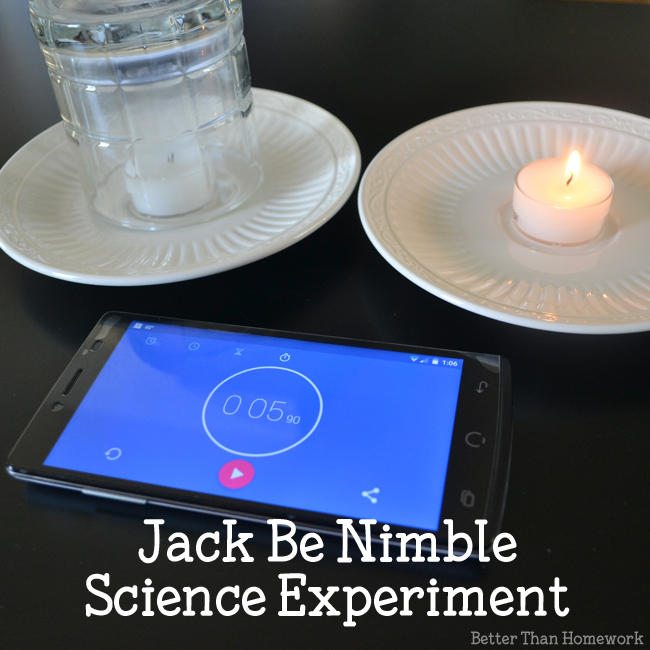 We experimented with candles for this Jack Be Nimble Science activity. It was so much fun! Disclosure: This post contains Amazon Affiliate links and other affiliate links. Please see my Disclosure Page for more details. 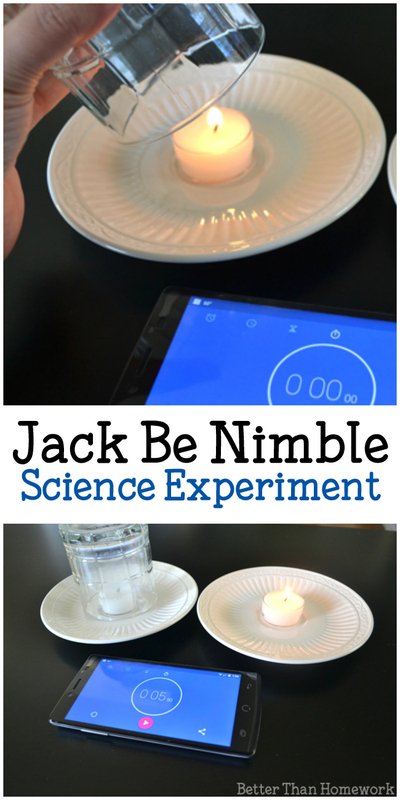 This science experiment uses fire. Please use caution and make sure there is an adult helper every step of the way. 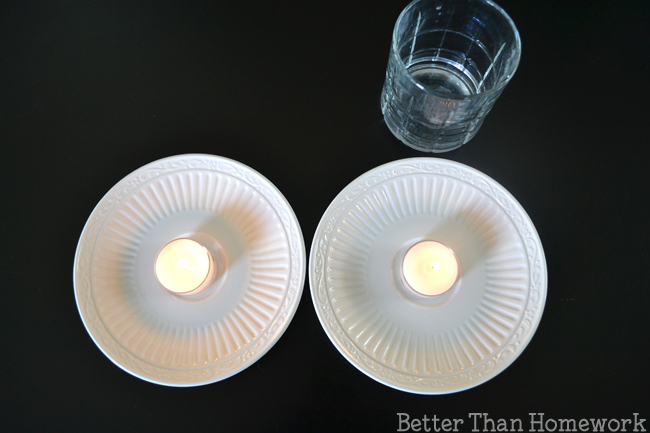 Set a tea light on each saucer and place them side by side. Make sure there is enough room to put the glass over one of your candles. Prepare your timer. We used the timer app on my phone. Finally, light both of your candles. Everything needs to be set up before you start this experiment. 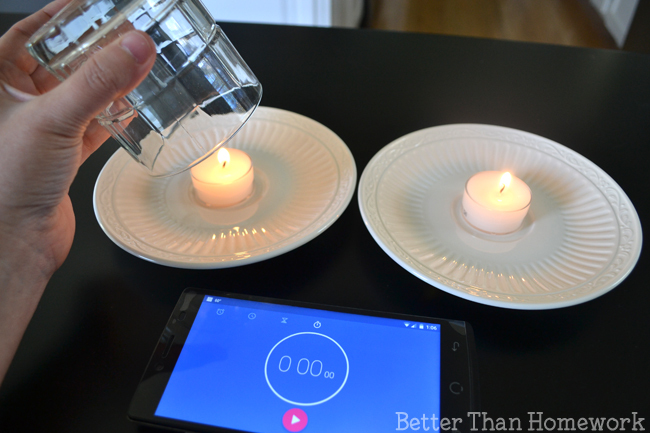 What will happen if you put the drinking glass over one of the candles? Which candle is going to stay lit the longest? How much longer do you think it will be? Take the time to discuss with your kids about what they think will happen during this experiment. This experiment moves fast, so be ready! Place your drinking glass over one of your lit candles. Start your time as soon as you set your glass over the candle. Hint: Use both hands! Hold the glass with one hand and start the time with the other. Keep a watch on the candles. 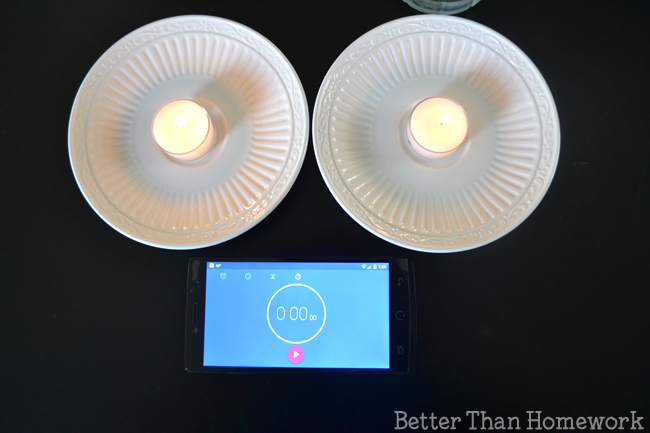 As soon as one candle goes out, stop the timer. Which candle stayed lit the longest? How long did it take to go out? Fire needs two things to burn: oxygen and fuel. If you take one of these away, your fire will burn out. 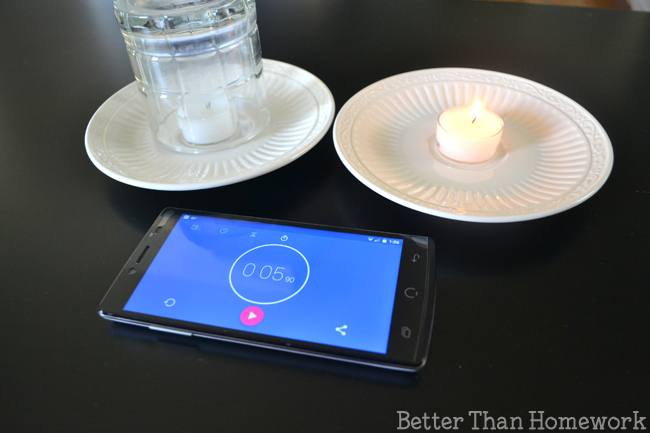 When we placed the drinking glass over our candle, we reduced the amount of oxygen. It didn’t take long for our fire to use up that bit of oxygen. Our candle burned out in under six seconds! Our second candle had a constant supply of oxygen, so it stayed lit until we blew it out. What was the result of your experiment? How long did your candle underneath the glass stay lit? If you enjoyed this Jack Be Nimble science activity, the above photo is perfect for sharing on Facebook or you can save the picture below on Pinterest.